It is located in County Antrim on the northeast coast of Northern Ireland, about three miles (4.8 km) northeast of the town of Bushmills. 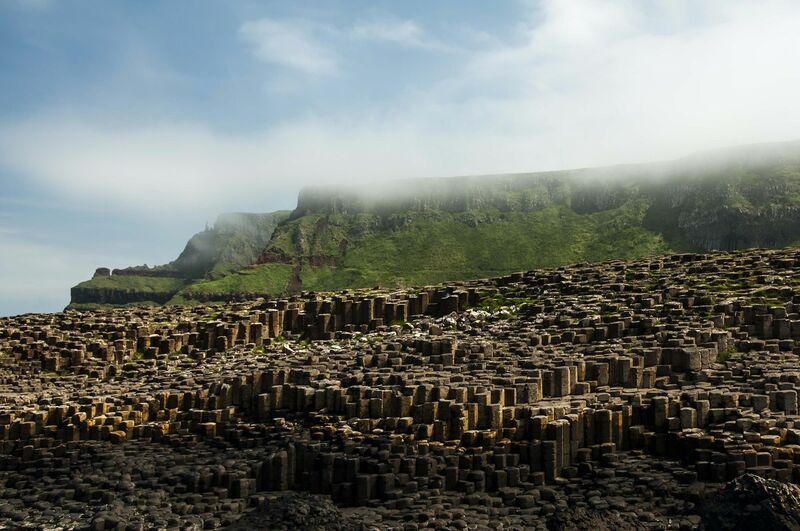 It was declared a World Heritage Site by UNESCO in 1986, and a national nature reserve in 1987 by the Department of the Environment for Northern Ireland. In a 2005 poll of Radio Times readers, the Giant's Causeway was named as the fourth greatest natural wonder in the United Kingdom. The tops of the columns form stepping stones that lead from the cliff foot and disappear under the sea. Most of the columns are hexagonal, although there are also some with four, five, seven or eight sides. The tallest are about 12 metres (39 ft) high, and the solidified lava in the cliffs is 28 metres (92 ft) thick in places. Much of the Giant's Causeway and Causeway Coast World Heritage Site is today owned and managed by the National Trust and it is one of the most popular tourist attractions in Northern Ireland. The remainder of the site is owned by the Crown Estate and a number of private landowners.